The Alamo was originally built in the late 1700’s as a mission, a place to convert Indians to Christianity. It was used as a burial ground between 1724 and 1793. Then, in 1836, it was the site of the bloody Battle of The Alamo. This was during the Texas Revolution. 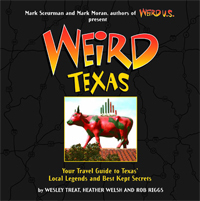 American colonists in Texas were fighting for independence from Mexico. Using the Alamo as a fortress, approximately 200 Texans held off thousands of Mexican soldiers for 13 days. Finally, the fortress fell and the rebellious Texans inside were all killed. Their bodies and the bodies of more than a thousand Mexican soldiers were disposed of in various ways. Many corpses were buried. Others were chopped up, burned or tossed in the San Antonio River. Ghosts have been spotted in the Alamo ever since. Twice, Mexican troops were ordered to destroy the Alamo, and, both times, soldiers claimed that spirits appeared to protect the fortress. “Do not touch the Alamo, do not touch these walls!” they warned. Terrified, the soldiers ran away and refused to return. In the late 1800’s, the Alamo was used as a jail. The staff and prisoners complained of moaning sounds, phantom shadows and eerie apparitions pacing the roof. 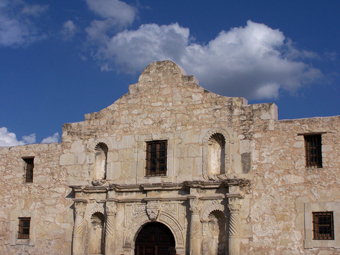 Today, the Alamo is one of the most popular destinations in Texas. Millions visit each year and there are more weird sightings than ever. Tourists have reported seeing ghosts dancing along the outer walls, huddled in the barracks and even roaming about in the gift shop. Some say that the mission is haunted by the ghost of a small blond boy eternally searching for his father. 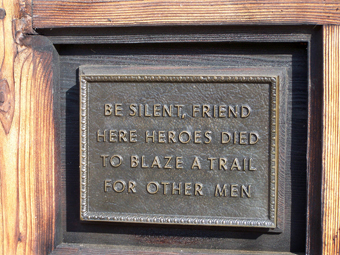 “Remember the Alamo!” cried Sam Houston’s Texan Army during the Battle of San Jacinto in 1836. It seems that a lot of ghosts have taken this advice to heart.